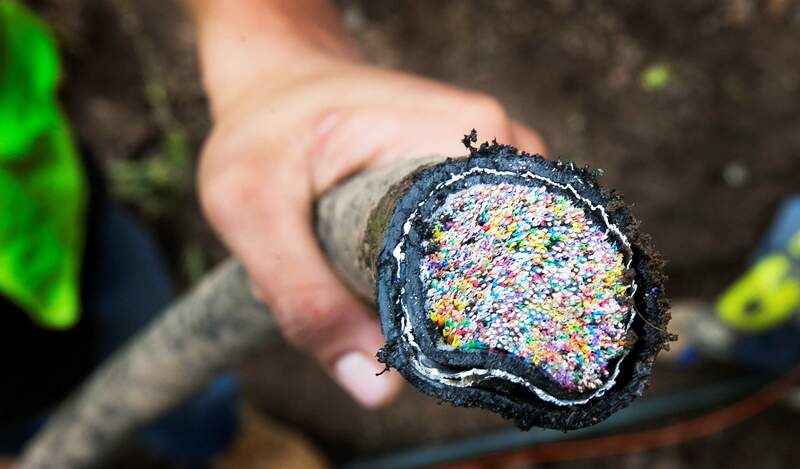 A fiber-optic line severed near Cortez on Friday disrupted communications across a swath of Southwest Colorado. Managers of the region’s 911 dispatch center didn’t know this kind of outage was possible, and now they plan to bring their concerns before a state panel. Widespread phone and internet outages Friday demonstrated a weakness in regional fiber-optic connectivity, especially for 911 dispatch centers. Dispatch centers in La Plata, Archuleta and Montezuma counties, and in Ignacio and Telluride, were all affected by the outage caused by a construction crew that cut a fiber-optic line in Cortez. Many calls had to be routed through the dispatch center in Montrose from Friday evening through early morning Saturday. The director of the Durango/La Plata Emergency Communications Center Phil Campbell, thought the system had redundancies built in. “There is not supposed to be one single cut that would take it all down,” he said. CenturyLink spokeswoman Shelley Bailey Silverman declined to answer questions about why the fiber-optic line damage affected such a large area. In Archuleta County, 911 phone calls were functional, but not all calls to the nonemergency dispatch number were coming through. Callers often use this number even in emergencies, said Carl Nevitt, Archuleta County consolidated emergency communication director. Like Campbell, Nevitt thought the system was protected from this kind of outage. “We all thought and assumed we had this redundancy. Instead of being part of a loop that would provide redundancy, it’s like we’re at the end of a rope,” Nevitt said. Campbell believed there were two sets of lines for 911 calls, four routed through Grand Junction and four through Montrose. This redundancy was set up to prevent an outage like the one that happened on Friday. Campbell plans to take the concerns from regional dispatch managers to the Colorado Public Utilities Commission 911 Task Force. “CenturyLink is going to have to answer some questions. ... They are responsible for the routing of calls,” he said. Campbell sits on the board, along with a representative from CenturyLink, and he expects that person to address technical questions about the outage. The company did communicate with Campbell, as required, during the service disruption that lasted from about 2:30 p.m. Friday to about 12:30 a.m. Saturday. But he wants to have a deeper discussion with the board about redundancy. However, a quick fix without new infrastructure may not be possible. In these kinds of outages, routing calls to Montrose can cause delays because dispatchers must relay information back to the law enforcement agency with the outage, and it also requires more staff, he said. Despite this challenge, all the emergency calls were addressed during the outage, Campbell said. The outage also alerted the Southwest Colorado Council of Governments to the deficiency in the fiber-optic system, said Miriam Gillow-Wiles, the executive director of the council. “Governments didn’t know this was a weakness,” she said. Companies are not required to disclose the location of fiber-optic lines and the lease agreements to governments, she said. The council will be looking into the outage as part of a larger report on the need for enhanced regional fiber-optic infrastructure. The report is expected to be released in the fall. The damage to the fiber-optic line likely also caused the cellphone outages across the region because cellphone towers rely on fiber-optic lines, she said. Redundancy for emergency communication has also been a problem in other parts of the state. The Larimer Emergency Telephone Authority, in northern Colorado, brought similar concerns to the Public Utilities Commission after the major floods in 2013 caused widespread telecommunications outages, said Terry Bote, external affairs manager for the agency. An interim legislative task force has been asked to examine 911 service as well, but a meeting for this group has not been scheduled.